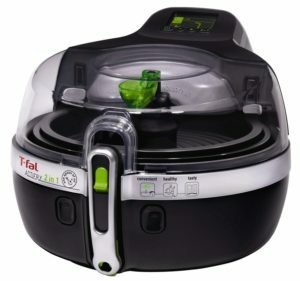 T-Fal Actifry is one of the popular air fryers on Amazon and if you are looking to cook healthier meals then this cooker/air-fryer from T-Fal might be a really good option. T-Fal air fryers are really big and you can easily cook two dishes at a time inside them. Initially, we were skeptical if they were as good as they claimed but after using them we realized that they are amazing for cooking a full meal. You need one tbsp of oil or even less depending on the type of recipe you are cooking inside the air fryer. The air fryer is a good investment for someone who is looking for a healthier way to cook their food. You can enjoy all your favorite fried foods inside the air fryer like French fries, chicken wings, potato pops, etc. The air fryer gives a nice fried taste with little to no oil which is the reason we love T-Fal Actifry air fryer even more. 1. The T-Fal Airfryer is user-friendly, the insulated handle and the entire frying basket and cooking tray, everything seems very easy to use and you can get used to cooking in this air fryer within a day. The air fryer has a lot of space, as you can cook more than one dish at a time and it needs very less oil basically 1 tbsp to cook one kg fries which is pretty impressive for someone who is watching their weight. 2. You can cook one kg of french fries at a time which is pretty impressive as you do not need to cook in batches and you can cook a large quantity of food for your family at once. This air fryer can easily serve 3-4 people and you can cook two dishes at a time, one in the basket at the bottom and the other on the tray above. 3. Both the tray and the basket keep rotating so that the food is we found that even not doing it cooked the fries really well. The fries come out crisp and cooked perfectly, so if you want to enjoy fries and other food items without deep frying them then this air fryer is perfect. 4. You can cook fish, pizza, vegetables and various other dishes inside this air fryer. It can cook most of your snacks that you usually deep fry in a healthier way since you are using only 1-2 tbsp of oil and yet it gives you a nice fried taste. The T-Fal Air fryer is the right option you need in order to have a healthier food eating habit and if you are on your way to losing some weight around the waist but at the same time want to enjoy your favorite snacks then this air fryer can really help. 5. The air fryer has temperature and time settings so you can set the time and temperature according to the food that you choose to cook inside the air fryer. In the case you want to cook something that takes longer, you can place that in the basket below and then keep adding things on the tray that cook faster. 6. Overall, cooking on the air fryer is amazing and you can cook a lot of things without any issues. It was extremely easy to use and it can cook food for 3-4 people at once which is really handy if you want to cook a meal for your family with this air fryer. 7. Cleaning the air fryer was super easy as well since all that you needed to do was remove the tray and the cooking basket and then clean them. This makes maintaining the entire air fryer easy. The air fryer is portable and medium-sized as well so all you need is some space on the countertop in order to keep your air fryer. 1. It does take some time to cook inside the air fryer. So you might want to be ready beforehand with all the cooking if the guests are coming over. Since you would be cooking in two tiers, you might want to get used to using them together as it does take some time to get used to because both the layers might require different time and temperature for cooking. Overall, the T-Fal air fryer is perfect for someone who is looking for an air fryer to cook meals. If you want to cook a nice meal for your family or make french fries and other fried foods for 3-4 people at a time then you should definitely get this air fryer. If you use both the basket and the tray then you might be able to cook for 6-7 people easily. The main aim here is to use the space conveniently so that you can easily cook a lot of food without any issues. The taste of the food cooked inside this air fryer is just like deep fried foods. Cooking is easier as well with all the insulation and the innovate handle design that lets you remove the hot tray easily while you are cooking. The rotary motion of the tray and the basket helps a lot on even cooking which is way better than the usual air fryers that usually require a lot of basket removal and turning the food so that the heating takes place evenly. Overall, the air fryer is really good if you want to get into a healthier eating and want to enjoy all your favorite deep-fried foods like the potato similies, french fries, chicken wings without having to compromise on your health. 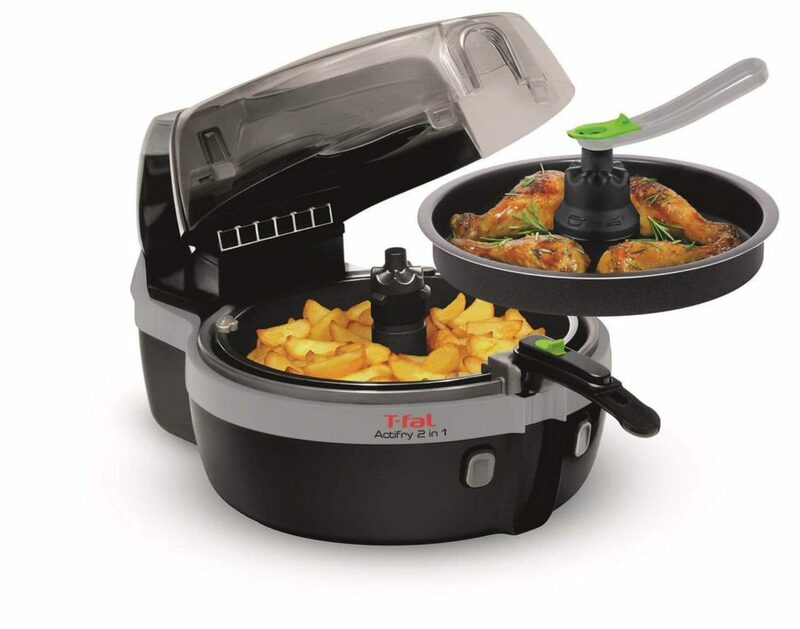 You should definitely check out the T-Fal 2 in 2 Actifry as it is amazing and cooks food amazingly well. You can cook a ton of recipes with this air fryer and in the case, you have some experiences with this air fryer then let us know in the comments down below.